iTunes is known to have bugs and errors that keep occurring from time to time, making the entire experience of iPhone file management and file transfer a hassle. One of these issues occurs when iTunes tries to update to a newer version. This error prevents users from launching iTunes by showing a message "iTunes cannot be opened while it is being updated". 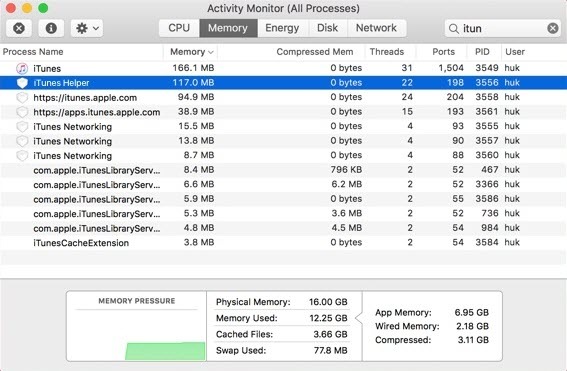 This problem occurs relatively more on Mac than on Windows. How to Fix "iTunes cannot be opened while it is being updated" on Mac? Following are some effective solutions. You can try them one by one until the problem is solved. Completely uninstalling and then reinstalling iTunes usually solves iTunes-related issues. It is recommended that you install the latest version after uninstalling iTunes. And if you already have the latest version, then resetting its settings might help. In any case, you will need to uninstall the software completely. A complete uninstallation of iTunes will delete your user settings, playlists, etc. Apple does not make it easy to uninstall softwares, especially iTunes. So the process requires some extra steps. Step 1. Simply drag the iTunes icon from desktop and drop it into Trash. 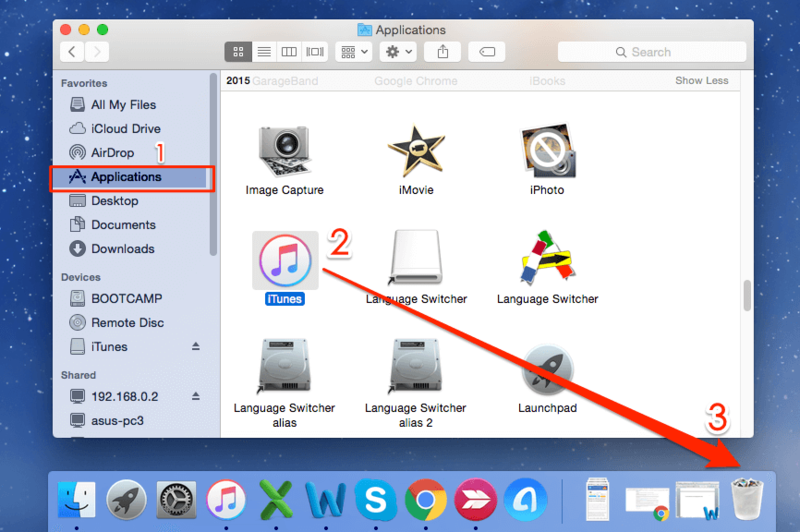 If you can’t proceed with the above mentioned method, then go to Applications folder, right-click the iTunes.app file, and click Get Info. Once the information is displayed, click the padlock icon and type in your Admin Password. Navigate to Sharing & Permissions and set ‘everyone’ to Read & Write. Now you will be able to uninstall iTunes via dragging its icon into Trash. Step 2. Once the iTunes icon is in Trash. Empty it. Step 3. Find and launch Activity Monitor. Once there, find and remove iTunes Helper. Step 4. Now remove the files with ‘com.apple.itunes’ at the start. You will find these files in Library > Preferences. Step 6. Download and install latest version of iTunes from the official website. Step 1. Open App Store and search for macOS. Step 2. Click on the latest version from the results and select Download. You may need to provide your Apple ID information to proceed. Step 3. Once the download is completed, you will be asked to begin the installation process. Step 4. Click Continue if you are ready to install. Step 5. 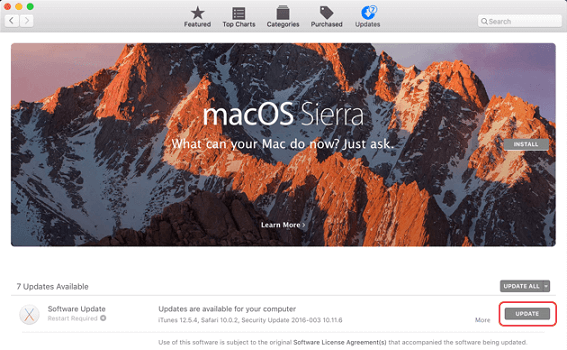 Follow the on-screen instructions to complete the software update installation process. Step 1. Hold down Option-Command. And then open iTunes. Step 2. Click on Continue. Then iTunes will be opened in safe mode. How to Fix "iTunes cannot be opened" Issue on Windows? 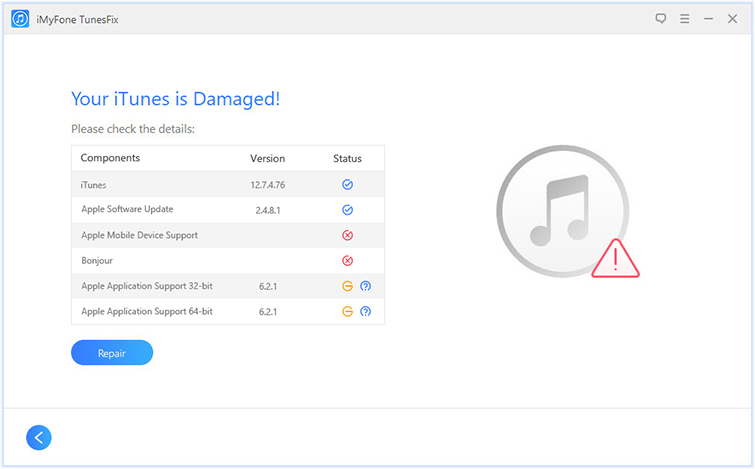 An easy and efficient way to repair "iTunes cannot be opened" issue is using iMyFone TunesFix, a professional iTunes repair tool. Now I will show you how to fix this issue with iMyFone TunesFix. Step 1. First, Download and launch iMyFone TunesFix on your Windows 10/8/7. Step 2. It will automatically detect your iTunes and its related components. If your iTunes or components are lost or corrupted, it will show you the details. Step 3. Click on Repair button to start repairing your iTunes and components. Once finished, your iTunes will work normally on your PC. TunesFix automatically detects iTunes issues upon launch and allows you to quickly fix them via its powerful Repair feature. There are no lengthy procedures to solve an iTunes issue. You simply need to use its Repair option to solve the problem with one-click. All iTunes issues/errors can be fixed via this software. TunesFix is safe to use and does not delete your valuable iTunes data while attempting the fixes. Free up space on your PC by erasing backup files, junk files, and other unnecessary files related to iTunes.